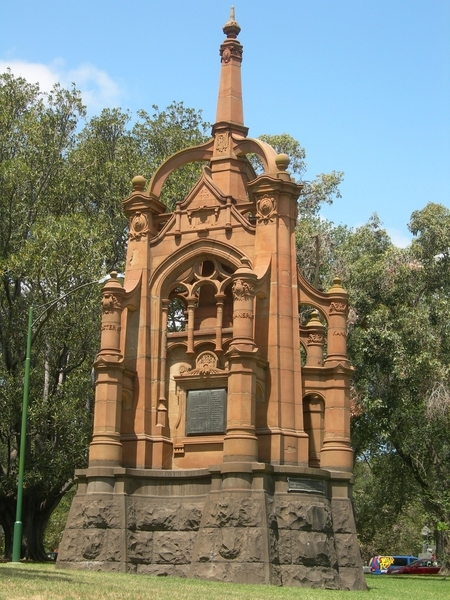 The Boer War Monument in St Kilda Road, located opposite the Victoria Barracks, was erected in 1903 shortly after hostilities ceased. The Boer War was the name given to the South African Wars of 1880-81 and 1899-1902 fought between the British and the descendants of the Dutch settlers (Boers) in Southern Africa. As part of the British Empire, the Australian Colonies offered troops in 1899 and the first Mounted Australian units arrived in South Africa in December 1899. At least 12,000 Australians served in contingents raised by the six colonies or (from 1901) the new Australian Commonwealth. It is believed that at least 600 Australians died in the campaign, nearly half (265) being from Victoria. The Monument is very unusual in the Australian context as it was funded by the Victorian Mounted Rifles Regiment, rather than public subscription. 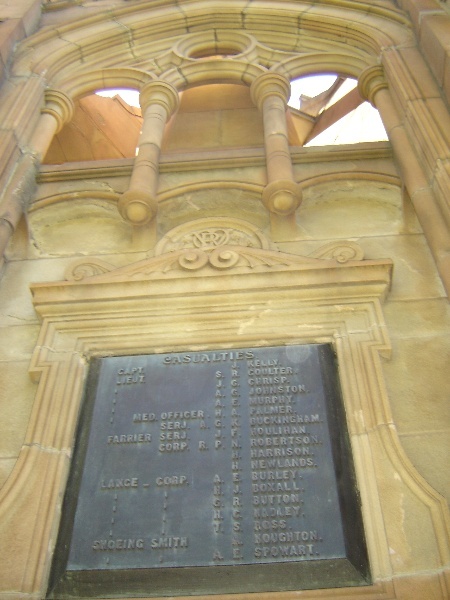 The monument was "erected by the members of the 5th Victorian Contingent VMR in memory of their fallen comrades in South Africa". 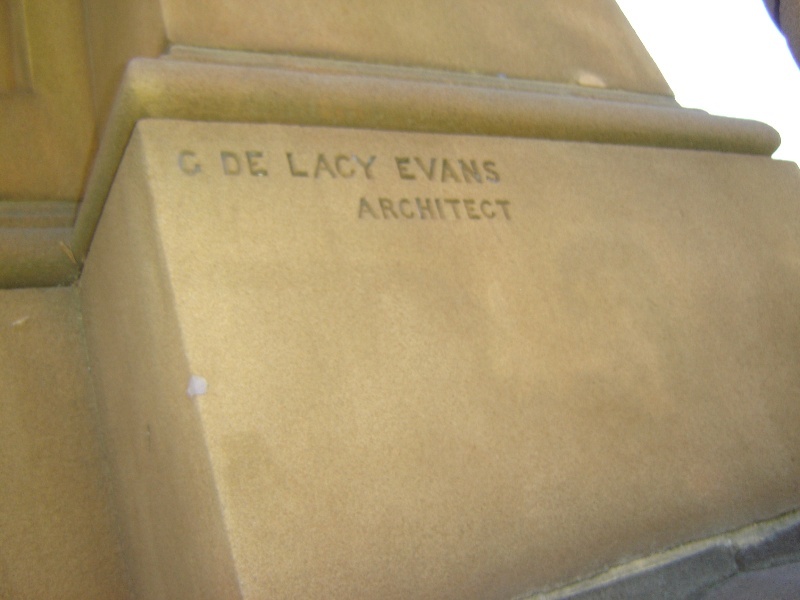 The monument itself is made of sandstone with a bluestone base, and designed by the noted architect George De Lacy Evans. Evan's other works included Warehouses in Niagara Lane (VHR 473), the Sum Kum Lee Buildings in Little Bourke Street (VHR442), the Lygon Buildings in Carlton (VHR 406) and the Union Church in Elsternwick (VHR 704). The sculpture was completed by Joseph Hamilton who later described the monument as a 'tower'. The monument combines gothic elements, with piers, arches and flying buttresses sculpted in stone. Three bronze plaques list the dead, with their rank. The Victorians served in mounted units and this is reflected in the number of casualties amongst mounted soldiers, farriers and shoeing smiths. 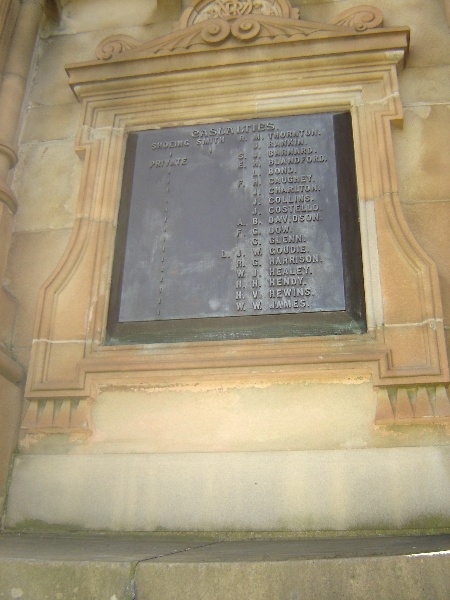 The names of the places in South Africa where the Victorians saw action are inscribed on the supporting pillars. The Victorian Military Badge has also been incorporated into the design, emphasising the fact that this is a Victorian rather than national memorial. The monument was moved a few metres in 1966 to an embankment facing St Kilda Road to allow for road widening and is nowa garden setting. 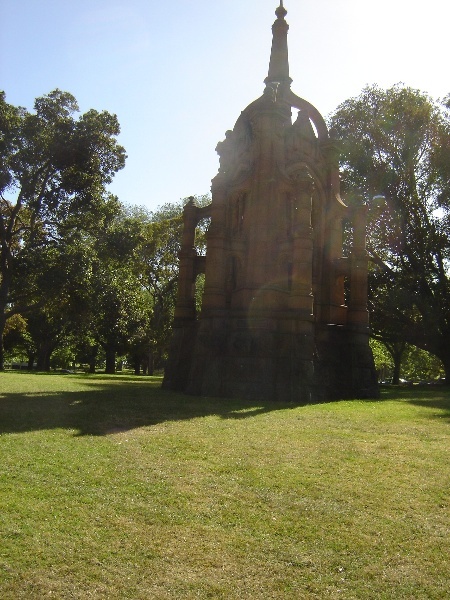 The Boer War Monument is of historic and aesthetic significance to the State of Victoria. 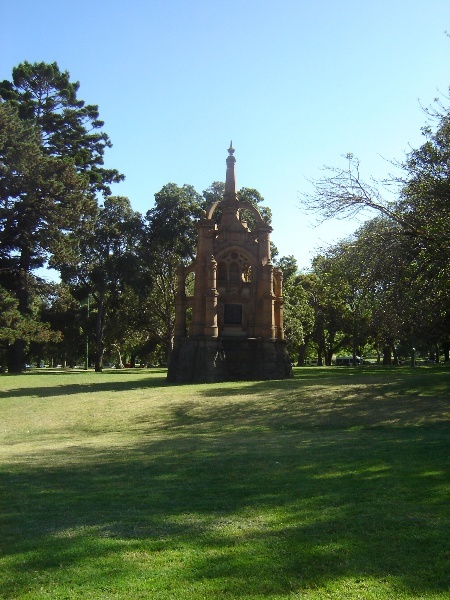 The Boer War Monument is of historic significance to the State of Victoria as it commemorates the participation of Victorians in the Boer War. 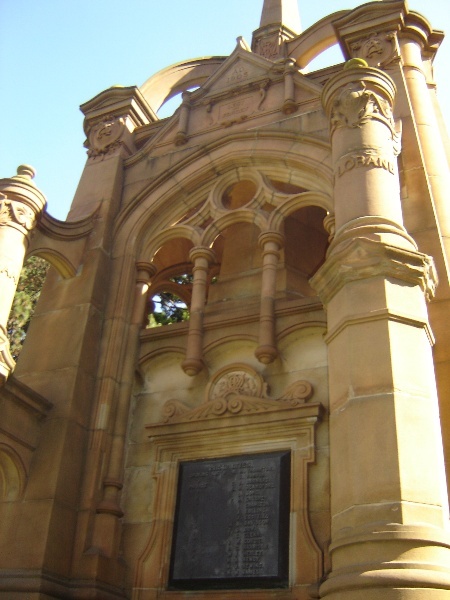 The Boer War Monument is of aesthetic significance to the State of Victoria as a finely executed work by architect George de Lacy Evans and sculptor Joseph Hamilton. Boer War Monument, Kings Domain, St Kilda Road & Government House Drive, Melbourne, Melbourne City Council. 1. All of the structure known as the Boer War Monument shown B1 on Diagram 382 held by the Executive Director. 2. 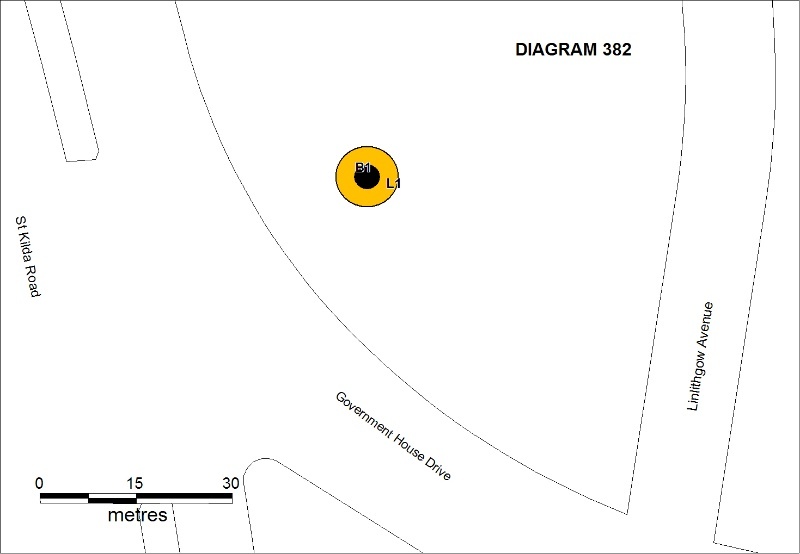 All of the land shown L1 on Diagram 382 held by the Executive Director being a circle of 5 metres radius from the centre of the monument. The Boer War Monument in St Kilda Road, opposite the Victoria Barracks, was erected in 1903 shortly after the hostilities ceased. 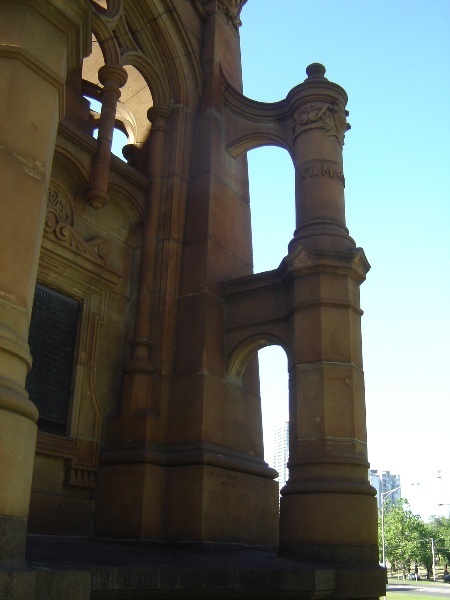 The Monument is very unusual in the Australian context as it was funded by the Victorian Regiment, rather than public subscription. The monument was a tribute to their fallen comrades. Regimental monuments had a long history in British Regiments (see Inglis, Sacred Places : War Memorials in the Australian Landscape pp.50-51). 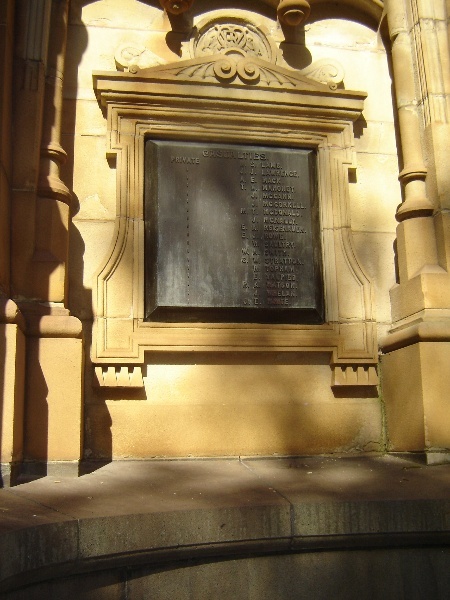 There are a number of other memorials in Victoria, two are on the Victorian Heritage Register. The National Monument (VHR 1374) further down St Kilda Road, was not finished until 1924 and added to further in the 1950s. The St Kilda Memorial (VHR1375), although more elaborate than many is fairly typical noting those who fell in South Africa. Many country towns and some suburbs have a Boer War memorial, which was overshadowed by the usually larger and more elaborate World War One memorial. This memorial was moved from its original place in St Kilda Road, to the beginning of Government House Drive, still opposite the Barracks, in 1966. General Conditions: 1. All exempted alterations are to be planned and carried out in a manner which prevents damage to the fabric of the registered place or object. General Conditions: 2. Should it become apparent during further inspection or the carrying out of works that original or previously hidden or inaccessible details of the place or object are revealed which relate to the significance of the place or object, then the exemption covering such works shall cease and Heritage Victoria shall be notified as soon as possible. Note: All archaeological places have the potential to contain significant sub-surface artefacts and other remains. In most cases it will be necessary to obtain approval from the Executive Director, Heritage Victoria before the undertaking any works that have a significant sub-surface component. General Conditions: 3. If there is a conservation policy and plan endorsed by the Executive Director, all works shall be in accordance with it. Note: The existence of a Conservation Management Plan or a Heritage Action Plan endorsed by the Executive Director, Heritage Victoria provides guidance for the management of the heritage values associated with the site. It may not be necessary to obtain a heritage permit for certain works specified in the management plan. General Conditions: 4. Nothing in this determination prevents the Executive Director from amending or rescinding all or any of the permit exemptions. General Conditions: 5. Nothing in this determination exempts owners or their agents from the responsibility to seek relevant planning or building permits from the responsible authorities where applicable. Regular Site Maintenance : The following site maintenance works are permit exempt under section 66 of the Heritage Act 1995: a) regular site maintenance provided the works do not involve the removal or destruction of any significant above-ground features or sub-surface archaeological artefacts or deposits; b) the maintenance of an item to retain its conditions or operation without the removal of or damage to the existing fabric or the introduction of new materials; c) cleaning including the removal of surface deposits, organic growths, or graffiti by the use of low pressure water and natural detergents and mild brushing and scrubbing; d) repairs, conservation and maintenance to plaques, roads and paths, fences and gates and drainage. e) the replacement of existing services such as cabling, plumbing, wiring and fire services that uses existing routes, conduits or voids, and does not involve damage to or the removal of significant fabric. Note: Surface patina which has developed on the fabric may be an important part of the item's significance and if so needs to be preserved during maintenance and cleaning. Note: Any new materials used for repair must not exacerbate the decay of existing fabric due to chemical incompatibility, obscure existing fabric or limit access to existing fabric for future maintenance. Repair must maximise protection and retention of fabric and include the conservation of existing details or elements. Landscape Maintenance : The following landscape maintenance works are permit exempt under section 66 of the Heritage Act 1995, a) landscape maintenance works provided the activities do not involve the removal or destruction of any significant above-ground features or sub-surface archaeological artefacts or deposits; b) watering, mowing, top-dressing and fertilising necessary for the continued health of plants, without damage or major alterations to layout, contours, plant species or other significant landscape features; c) pruning to control size, improve shape, flowering or fruiting and the removal of diseased, dead or dangerous material. Public Safety and Security : The following public safety and security activities are permit exempt under section 66 of the Heritage Act 1995, a) public safety and security activities provided the works do not involve the removal or destruction of any significant above-ground structures or sub-surface archaeological artefacts or deposits; b) the erection of temporary security fencing, scaffolding, hoardings or surveillance systems to prevent unauthorised access or secure public safety which will not adversely affect significant fabric of the place; c) development including emergency stabilisation necessary to secure safety where a site feature has been irreparably damaged or destabilised and represents a safety risk to its users or the public. Note: Urgent or emergency site works are to be undertaken by an appropriately qualified specialist such as a structural engineer, or other heritage professional. Signage and Site Interpretation : The following Signage and Site Interpretation activities are permit exempt under section 66 of the Heritage Act 1995, a) signage and site interpretation activities provided the works do not involve the removal or destruction of any significant above-ground structures or sub-surface archaeological artefacts or deposits; b) the erection of non-illuminated signage for the purpose of ensuring public safety or to assist in the interpretation of the heritage significance of the place or object and which will not adversely affect significant fabric including landscape or archaeological features of the place or obstruct significant views of and from heritage values or items; c) signage and site interpretation products must be located and be of a suitable size so as not to obscure or damage significant fabric of the place; d) signage and site interpretation products must be able to be later removed without causing damage to the significant fabric of the place; Note: The development of signage and site interpretation products must be consistent in the use of format, text, logos, themes and other display materials. Note: Where possible, the signage and interpretation material should be consistent with other schemes developed on similar or associated sites. It may be necessary to consult with land managers and other stakeholders concerning existing schemes and strategies for signage and site interpretation. Minor Works : Note: Any Minor Works that in the opinion of the Executive Director will not adversely affect the heritage significance of the place may be exempt from the permit requirements of the Heritage Act. A person proposing to undertake minor works may submit a proposal to the Executive Director. If the Executive Director is satisfied that the proposed works will not adversely affect the heritage values of the site, the applicant may be exempted from the requirement to obtain a heritage permit. If an applicant is uncertain whether a heritage permit is required, it is recommended that the permits co-ordinator be contacted. It is the purpose of the permit exemptions to enable routine maintenance and repairs which do not damage the significant fabric of the place, or diminish its cultural significance. Any conservation work undertaken on the monument should be undertaken by a conservator and after a plan has been agreed between the Executive Director and the City of Melbourne.